Qualification Bsc. (Hons), Msc. (Thesis), MPhil, PhD. 1) Md. Majharul Haque, Suraiya Pervin and Zerina Begum “Rule Based Replacement of Pronoun by Corresponding Noun for Bangla News Documents”. International Journal of Technology Diffusion, Vol. 8, Issue 2, April-June 2017. 2) Zerina Begum, Latticia D. Rozario, Kazi Shamima Sultana, and A. K. Roy, Design and Construction of ?-processor based DLTSSpectrometer, Research Publication of the Bose Centre for Advanced Study and Research in Natural Sciences, Dhaka University, 1 (1995) 20-38. 3) M A Hossain, M Z Hafiz, Z Begum and M L Rahman, High performance processors for real-time contro, Proceeding of the 1st National Conference on Computer and Information Systems, Dhaka, Bangladesh, Dec 9-10 (1997) 271-276. 4) Zerina Begum, Latticia D. Rozario, Kazi Shamima Sultana, and A. K. Roy, A simple ?-processor based DLTS system: a device to detect deep defect centres, Journal of Bangladesh Academy of Science, 22(2) (1998) 181-190. 5) Tania Rahman and Zerina Begum, Attitudes Towards Female Education And Employment Among Middle Class Families in Dhaka City, Bangladesh, Asian Journal of Psychology and Education, A.P.R.C. AGRA, 34(1-2) (2001) 11-18. 6) Zerina Begum, S. K. Bose and A. K. Roy, Study of Opto-Electrical Properties of Two Organic Dyes, Dhaka University Journal of Science, 55(2) (2007) 253-257. 7) Md. Nazrul Islam, Z. Begum, M. A. Gafur and A. H. Khan, Development, structure and strength properties of PP/Jute blends, Jahangirnagar University Journal of Science, 30(2) (2007) 89-106. 8) Zerina Begum, Mohammad Shoyaib, Syed Murtuza Baker and Md. Mahmud Uz-Zaman, Power Aligner: A prototype to Reduce the Computational Time of Needleman Wunsch Seller (NWS) Algorithm, Dhaka University Journal of Science, 55(2) (2007) 259-262. 9) Syeda Nadia Firdaus, Md. Mehedi Hasan, Mohammad Shoyaib and Zerina Begum, Prediction of Protein Secondary Structure from Amino Acid Sequence Using Probability Concept and SVM, Dhaka University Journal of Biological Science, 17(2) (2008) 159-163. 10) Mohammad Shoyaib, Md. Shariful Islam, M. Z. Hafiz and Zerina Begum, An Efficient Global Search Algorithm With Conflict Minimization for N-Queens Problem, Dhaka University Journal of Science, 56(2) (2008) 133-138. 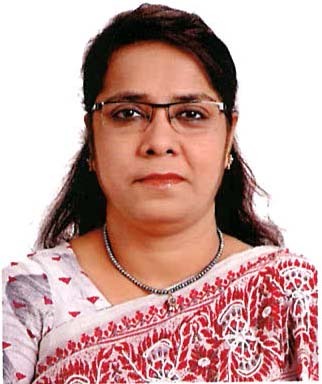 11) Zerina Begum, Kazi Shamima Sultana, M. Z. Hafiz and A. K. Roy, Construction of a Computerized Deep Level Transient Spectroscopic System, Accepted for Publication in the Dhaka University Journal of Science, 2008. 13) Zerina Begum, M. Z. Hafiz, Kazi Shamima Sultana and A. K. Roy, Development of Algorithm for a Computerized Deep Level Transient Spectroscopic (DLTS) System, Submitted for Publication in the Dhaka University Journal of Science, 2008. 14) Zerina Begum, Hosne Jahan Begum and A. K. Roy, Electrical Characterization of a few Organic Dyes, Submitted for Publication in the Dhaka University Journal of Science, 2008. 15) Zerina Begum, Hosne Jahan Begum, Md. Abdus Salam and A. K. Roy, Study of IR Spectra of Some Organic Semiconductor, Submitted for Publication in the Journal of Bangladesh Academy of Science, 2008. 16) M. S. Islam, M. M. Rahman, Z. Begum and M. Z. Hafiz, Low Cost Quantum Realization of Reversible Multiplier Circuit, Accepted for Publication in the Information Technology Journal (ANSI Publication), 2008. 17) M. A. Yousuf, Chinmoy Kumar Das, Md. Abdus Salam and Zerina Begum “Synthesis of Modified Conducting Polymers and Study of their Water Purification Capability”, Accepted for Publication in the Dhaka University Journal of Science, June 2009 (In Press). 18) Md. Saiful Islam, Muhammad Mahbubur Rahman, Zerina Begum, and Mohd. Zulfiquar Hafiz “ Efficient Approaches for Designing Fault Tolerant Reversible Carry Look-Ahead and Carry-Skip Adders”. MASAUM Journal of Basic and Applied Sciences, Vol. 1, No. 3, October 2009. 19) Md. Saiful Islam, Muhammad Mahbubur Rahman, Zerina Begum, and Mohd. Zulfiquar Hafiz “ Fault Tolerant Reversible Logic Synthesis: Carry Look-Ahead and Carry-Skip Adders”. July 15-17, 2009 Zouk Mosbeh, Lebanon ACTEA 2009. 21) Md. Saiful Islam, Member, IACSIT, M.M. Rahman, Zerina Begum and M.Z. Hafiz “ Fault Tolerant Variable Block Carry Skip Logic (VBCSL) Using Parity Preserving Reversible Gates”. International Journal of Computer and Electrical Engineering. Vol. 3. No. 1, February 2011, 1793-8163. 22) Md. Saiful Islam, Member, IACSIT, Mohd. Zulfiquar Hafiz and Zerina Begum, “ Quantum Cost Efficient Reversible BCD Adder for Nanotechnology Based System”. 23) Saiful Islam, Muhammad Mahbubur Rahman, Zerina Begum, and Mohd. Zulfiquar Hafiz, “Realization of a Novel Fault Tolerant Reversible Full Adder Circuit in Nanotechnology”, The International Arab Journal of Information Technology, Vol. 7, No. 3, July 2010. 25) Md. Majharul Haque, R. H. M. Alaol Kabir, Md. Shakil Ahamed Shohag, Dr. Zerina Begum, “Biometric Based Web Security Using Ridges of Fingers”. International Journal Of Engineering And Computer Science ISSN:2319-7242,,Volume 2 Issue 8 August, 2013 Page No. 2348-2354. 26) Md. Majharul Haque, Suraiya Pervin and Zerina Begum “Literature Review of Automatic Single Document Text Summarization Using NLP”. International Journal of Innovation and Applied Studies, ISSN 2028-9324, Vol. 3 No. 3 July 2013, pp. 860-868. 29) Md. Majharul Haque, Suraiya Pervin and Zerina Begum “Automatic Bengali News Documents Summarization by Introducing Sentence Frequency and Clustering”. 18Th International Conference on Computer and Information Technology (ICCIT), 21-23 December, 2015. 30) Md. Majharul Haque, Suraiya Pervin and Zerina Begum “An Innovative Approach of Bangla Text Summarization by Introducing Pronoun Replacement and Improved Sentence Ranking”. Journal of Information Processing Systems, Vol. 13, No. 4, pp 752-777, August 2017. 31) Mirza Rehenuma Tabassum, Alim Ul Gias, Md. Mostafa Kamal, Hossain Muhammad Muctadir, Asif Khan Shakir, Asif Imran, Saiful Islam, Md. Golam Rabbani, Shah Mostafa Khaled, Md. Saiful Islam, Dr. Zerina Begum, "Comparative Study of Statistical Skin Detection Algorithms for Sub-Continental Human Images", Information Technology Journal (ITJ), Vol. 9, 2010, pp811-817. 32) Begum, Zerina, Mohammed Shafiul Alam Khan, Mohd Hafiz, Md Islam, and M. D. Shoyaib. "Software development standard and software engineering practice: A case study of Bangladesh." arXiv preprint arXiv:1008.3321 (2010).